Pumps are used for a variety of applications such as dewatering, power washing, metering and more, but no matter what sort of pump you are in the market for, choosing the right one for your needs is critical. 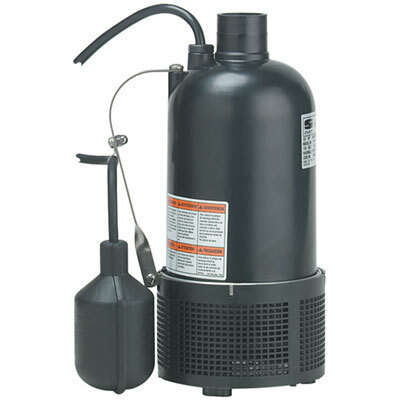 At TekSupply, we offer many different sump pumps, as well as booster pumps, centrifugal pumps and hydroponic pumps. A sump pump is a pump that is used to remove water from a sump pit. A sump pit is a hole that is dug into the ground for water collection. The sump pit will collect water that is somewhere it shouldn't be, for example in the basement of a home, and the sump pump will remove the water from the pit. What sump pumps does TekSupply offer? 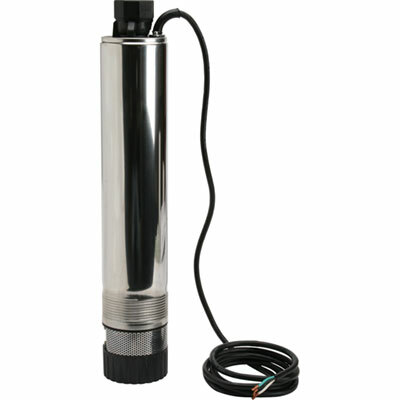 All of the sump pumps that TekSupply offers are submersible pumps. This means that the entire pump is installed in the sump pit. These pumps are specially wired so they won't short out when they come in contact with the water. An advantage to having a submersible pump is that the noise when it is running is less noticeable and the pump itself will be less of an eyesore. Another benefit of submersible pumps is that the water keeps it cool to prevent the motor from burning out. 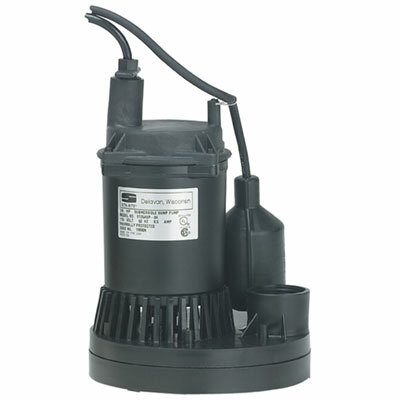 TekSupply has many different submersible sump pump options, depending on your needs. Sta-Rite Sump Pumps: Submersible Sump/Effluent Pumps from Sta-Rite are cast iron and feature vortex impellers to provide solids-handling capacities up to 1/2". All of these pumps come with a 10' power cord and have a 1-1/2" NPT pump discharge. 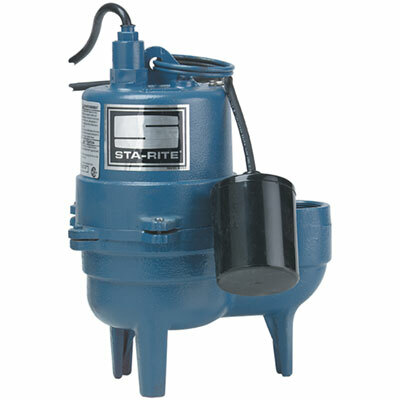 Sta-Rite Submersible Utility/Sump Pumps are compact and lightweight so they can fit virtually anywhere. Manufactured from corrosion-resistant, high-impact engineered resin, these units can pump up to 5,100 GPH at a 5' discharge head and up to 3,000 GPH at a 15' discharge head. Head is defined as the increases or decreases in pressure due to gravity and friction that liquids experience while moving through a system. If head increases, flow will decrease and vice versa. Cast Iron Submersible Solids Handling Pump from Sta-Rite is rugged with a nonclog vortex impeller and solids handling capacity up to 2". This pump is great for use in sewage, effluent and waste water, sump drainage, dewatering and flood control. It has a 2" NPT discharge and automatic switch. Sta-Rite Submersible Sump Pump is ideal for basement sumps, dewatering and water transfer. It features a rugged, corrosion-resistant composite pump body and comes with an 8' cord. This unit pumps up to 2,280 GPH at a 5' discharge head and 840 GPH at a 15' discharge head. 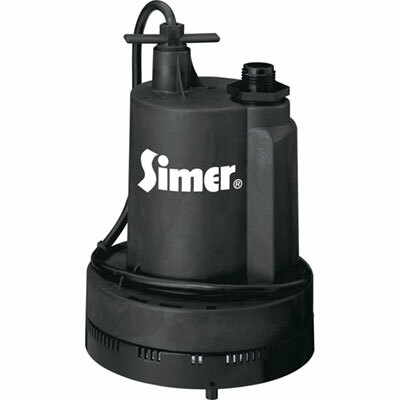 Simer Sump Pumps: Our Simer Submersible Utility/Sump Pump is portable and versatile. It can be used in a variety of areas such as window wells, basements and roof tops and functions at 1/4 HP. 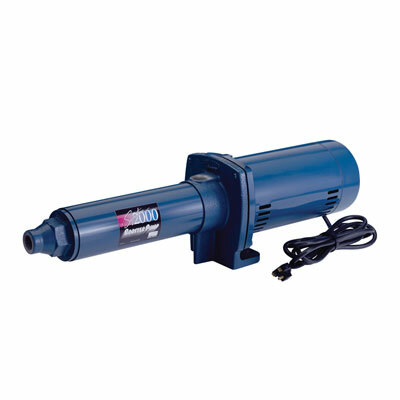 Easy to use, yet rugged, this pump features a corrosion-resistant plastic body construction. It has a self-cleaning screen which reduces maintenance and a maximum pumping capacity of 1,320 GPH. Equipped with an 8' power cord and garden house adapter, this unit has a cord wrap feature for organized storage and easy portability. 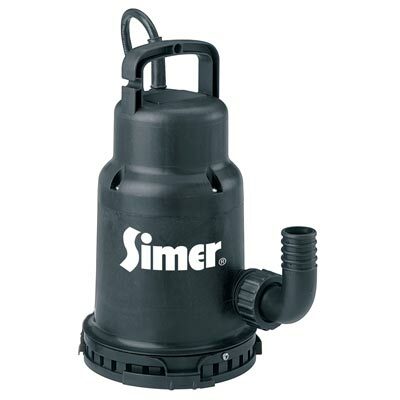 Our Simer Submersible Utility Pump is very similar to the Utility/Sump Pump. This pump also features a powerful, 10-amp motor with thermal overload protection and functions at 1/3 HP. With a maximum pumping capacity of 2,160 GPH, this unit is ideal for small drip irrigation setups. 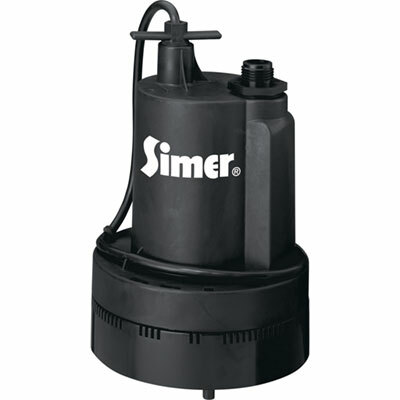 The Simer Submersible Waterfall/Utility Pump is ideal for hydroponic systems. Due to its quiet, oil-free motor, it is safe for both fish and plants. It can also be used for creating waterfalls and streams. With a maximum pumping capacity of 2,400 GPH, this pump is easy to install and made of heavy-duty thermoplastic and stainless steel materials to maximize pump life. 4" Multi-Stage Submersible 1/2 HP Pump: Made by Sta-Rite, this six-stage pump has a double-sealed motor with thermal overload protection. Water cools as it passes over the motor and dampens noise for a cooler, quieter operation. It is important that this pump is submerged at all times during operation. The 4" Multi-Stage Submersible 1/2 HP Pump is ideal for pumping out fish ponds because it is our only submersible pump that doesn't pose a danger to aquatic life. 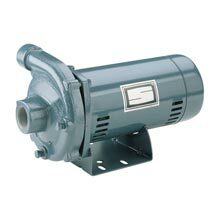 With a corrosion-resistant stainless steel shell and polycarbonate diffusers, this pump performs at 10 GPM and comes with a 10' power cord. Booster pumps are high-pressure pumps that are ideal for high-volume washdowns and greenhouse fogger nozzle systems. If you are using water from a well, water storage tanks or a municipal supply, it is not at a high enough pressure for some uses, such as removing built-up dirt from the exterior of your home. Using a booster pump will increase the pressure of the water from your water source. What booster pumps does TekSupply offer? Signature 2000 Booster Pumps: Our Signature 2000 Booster Pumps are great for high-volume washdowns and fogger nozzle systems. With an 80 PSI maximum inlet pressure and 315 PSI maximum working pressure, these pumps feature a stainless steel shell and shaft. They have acetal impellers and a polycarbonate diffuser. The maximum temperature for liquids running through this pump should be 140°F. These pumps, made by Sta-Rite, are available from 1/2 to 1-1/2 horsepower. Centrifugal pumps are used to transfer fluids from a piping system to a tank or reservoir or to transfer them from tank to tank. There is a rotary impeller inside a centrifugal pump that increases the velocity of the fluids moving through it, making it the ideal pump to move liquids through complex piping systems. What centrifugal pumps does TekSupply offer? High-Volume Centrifugal Pumps: Our High-Volume Centrifugal Pumps can quickly and easily move large volumes of water. All units feature a four-position discharge and a close-grained cast iron body. For easy winterizing, they also have a drain port. The medium head models feature heavy-duty motors for durability and long life. The J Series High-Volume Centrifugal Pumps come with Noryl® impellers which are abrasion resistant for normal applications and have working temperatures up to 140°F. These pumps are easily serviced and have replaceable wear rings. 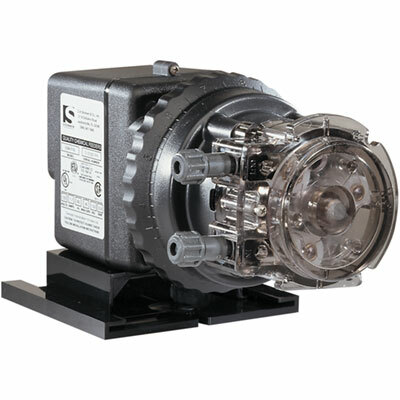 All of our Sta-Rite Pumps are also centrifugal pumps. What is a hydroponic pump? Pumps are a crucial part of hydroponic setups because they are what allows the water or nutrient solution to be pumped from the reservoir tank to the roots of the plants. 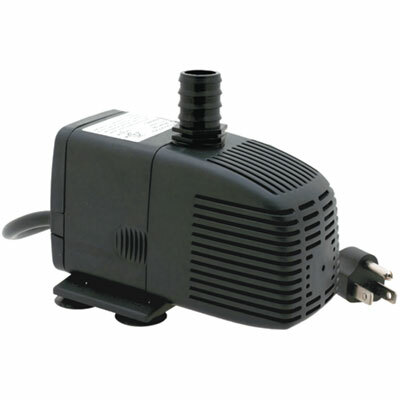 What hydroponic pumps does TekSupply offer? Dolphin Pumps: Dolphin Pumps are designed and manufactured for maximum efficiency and minimum power consumption, allowing for cost-effective and worry-free operation of hydroponic systems. Featuring high-performance wet end designs, these corrosion-resistant pumps have continuous-duty, weather-proof motors and dual-sealed bearings. They should be used for fresh water applications only and can be used for indoor and unprotected outdoor use. Anti-vibration pump pads and super seal unions are included. The Premium Efficiency Diamond Aqua Sea 9250 and 9500 feature high head pressure and low current draw. 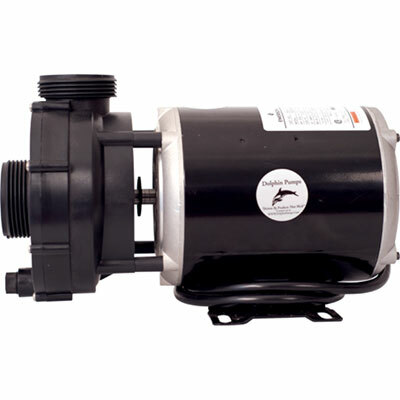 These pumps have a 1-1/2" supply and discharge. The 9250 model has an output of 9,250 GPH and the 9500 model has an output of 9,500 GPH. The Super Amp Master 7200 is designed to consume the lowest amount of energy per gallon pumped. Flow rates may be dialed back by a ball valve with no harm to the pump. The electric current draw will drop as the flow is reduced. This pump includes a super flow turbine-style impeller and a stainless steel crane seal for superior seal life. With a 2" supply and discharge, the Super Amp Master 7200 comes with a supply cord. The Super Sea Aqua 12500 features a super-efficient high head and a high-pressure/flow system pump. It is built to consume the lowest amount of current for each gallon pumped. With a 2" supply and discharge, it comes with a supply cord. 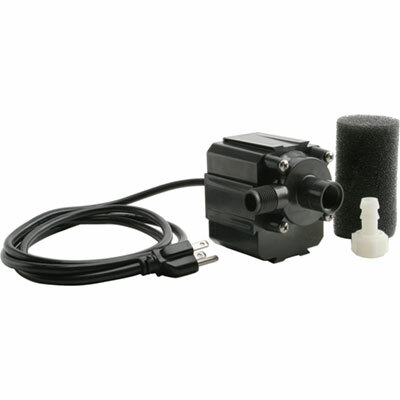 Indoor/Outdoor Magnetic-Drive Recirculation Pumps: These pumps are ideal for hydroponic systems, ponds and more. They are all oil free and environmentally safe and come with a one year manufacturer's warranty. The ActiveAqua Pumps are available in 250, 550 and 800 GPH flow rates and have removable foam filters and impellers included. These pumps are multi-use and submersible and feature powerful magnetic-drive construction. The Pro Recirculation Pumps are available in 500 and 700 GPH flow rates and have a 1/2" FPT inlet and 1/2" MPT outlet. These heavy-duty Danner Magnetic-Drive Pumps are fully submersible and can also be used as inline pumps. They include exclusive fine mesh foam pre-filters, impellers and hose/thread adapters. A metering pump is used to move a very specific amount of liquid in a timeframe chosen by the user. Metering pumps are commonly used for supplying nutrient solutions to crops or for medicating livestock, among other applications. They are meant to provide very accurate control over what chemicals or solutions are added to water lines. What metering pumps does TekSupply offer? Stenner Metering Pumps: Stenner Metering Pumps are capable of self-priming up to 25'. These single head, adjustable metering pumps won't lose their prime and chemicals are metered without exposure to air. Housed in corrosion-resistant Lexan® polycarbonate, they have all stainless steel fasteners and 44 RPM gear motors. Interchangeable tubes are available that change the output of the pump. They are adjustable from 5% to 100%. 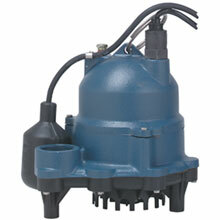 Stenner Metering Pumps can run dry without damage and are available with outputs from 5 to 85 gallons per day. 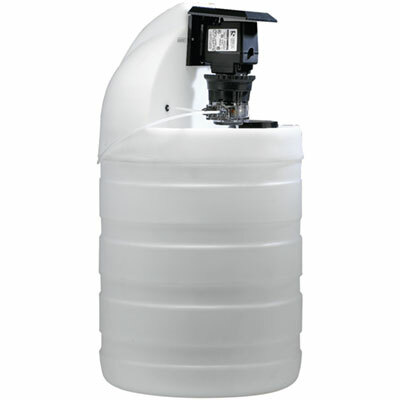 Stenner 30-Gallon Pump Tank Systems: Stenner 30-Gallon Pump Tank Systems include a pump and a rugged, polyethylene-constructed tank that is suitable for either indoor or outdoor use. This compact, lightweight system comes with a child-resistant lid and arrives pre-assembled for quick and easy installation. Solution level indicators, spill recovery and a rain roof that prevents water or chemical intrusion into the pump are also included. These systems are available in sizes from 5 to 40 gallons of output per day. If you are unsure which type of pump is ideal for your application, our knowledgeable National Account Managers are always willing to help you choose the products that best suit your needs. Feel free to contact us with any questions. Have questions about Sump Pumps? Visit our Live Help page or Contact Us.